Spring perennials provide some of the chief glories of the spring garden. Our list of favorites continues here . . .
Epimediums are becoming more and more popular, and no wonder, as there are not many spring perennials that can depended upon to perform better in dry shade than epimediums. 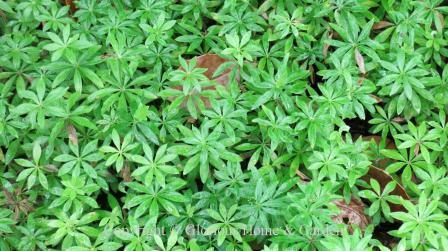 Though delicate-looking, these are pretty tough plants, and make wonderful ground covers. Give them woodsy, humusy soil and morning sun and they will multiply via rhizomatous roots. More and more species and cultivars are becoming available, as their popularity grows. Flower colors range from pure white to yellow, pink, red-orange and lilac; and rise above the leaves on wiry stems. The leathery leaves are heart-shaped and usually tinged with red-bronze when they emerge in spring. Epimedium grandiflorum, longspur or large-flowered barrenwort or bishop's hat, Zones 5-8. 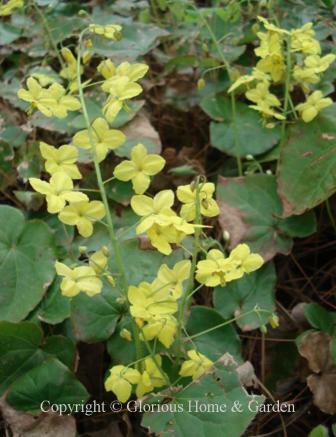 If you have an area of dry shade under trees in your garden, epimediums are one of the most rewarding spring perennials you can grow. The species, E. grandiflorum, has larger flowers than most epimediums. 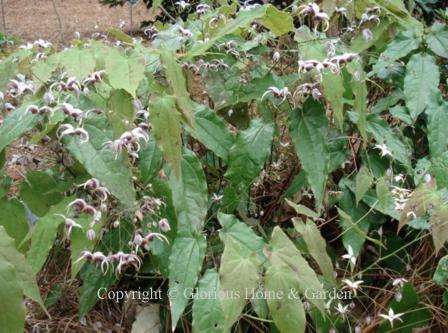 The flowers have rosy inner sepals and creamy-white inner petals with long spur and float above the bronze-tinged new foliage. Cultivars include 'Album' with pure white flowers, 'Lilifee' with violet flowers, 'Rose Queen' with rose-red flowers, and 'Silver Queen' with pink-tinged white flowers. Epimedium x omeiense, fairy wings, Zones 5-8. This long-spurred barrenwort looks a squadron of little birds in flight (or maybe crawling spiders!) rising above the leaves in spring. The violet flowers rise on 24" stems making it taller than most epimediums. 'Akame' has raspberry flowers tipped with yellow; 'Razzleberry' has raspberry flowers edge in white. Evergreen. 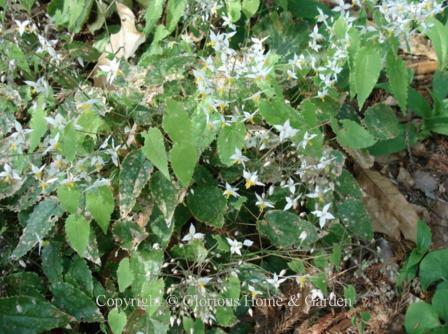 Epimedium sempervirens, barrenwort or fairy wings, Zones 5-8. Large white flowers with spurs and a more open cup than E. grandiflorum. Semi-evergreen to evergreen. 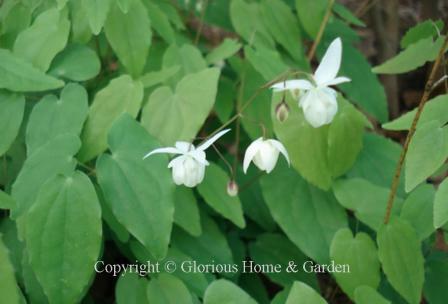 One great new cultivar, 'Cherry Hearts,' has white flowers, but the foliage is what is special. New leaves emerge red in spring and change to green with red margins that last through the season. 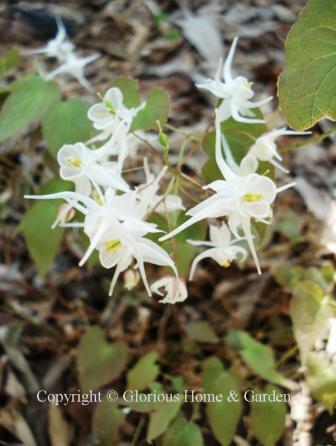 Epimedium x perralchicum, fairy wings, Zones 5-8. 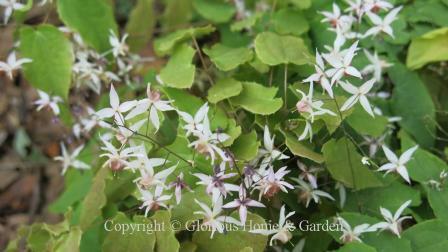 This epimedium is a hybrid between E. perralderianum and E. pinnatum ssp. colchicum. The small yellow flowers are borne in sprays, are nearly spurless, and the open petals resemble tiny narcissus. The variety 'Frohnleiten' is renowned for its beautiful reddish evergreen foliage. Epimedium stellulatum 'Long Leaf Form,' star-shaped fairy wings, Zones 4-8. This delightful spring perennial has long, narrow leaves with spiny, wavy edges. The tiny white and yellow flowers are borne on tall sprays above the evergreen foliage. Epimedium x youngianum, Young's barrenwort, Zones 5-8. This is a hybrid cross between E. diphyllum and E. grandiflorum, and has white to pink flowers. Selections include 'Azusa' with white flowers and silvery veining in the leaves; 'Niveum,' known as snowy barrenwort with dainty pure white flowers; 'Roseum,' lavender-pink; and 'Yenomoto,' with rosy buds opening white and larger than 'Niveum.' Deciduous. 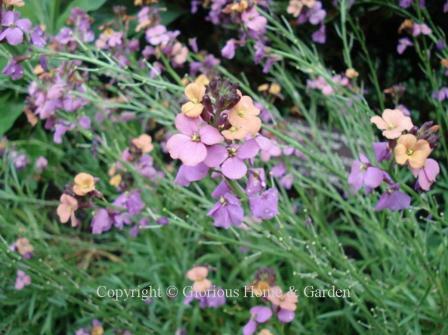 Erysimum linifolium, flax wallflower, Zones 5-9. Flax wallflower is one of those spring perennials that you must include in your garden. It has a long flowering season from winter into spring, but will only last a few years in the garden. The gray-green foliage is evergreen. One particularly excellent new variety is 'Jenny Brook' with multi-colored flowers of purple to mauve to apricot. 'Bowles Mauve' with purple blooms is also very popular, and 'Fragrant Star' with scented yellow flowers and variegated foliage is striking. Eschscholzia californica, California poppy, Zones 6-10. This spring perennial brings bright drops of sunshine to the garden blooming most heavily in spring and sporadically throughout the summer. 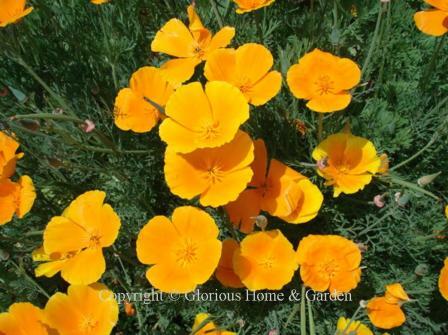 Easy to grow (and can be weedy in certain conditions) the California poppy is perennial in warmer climates and is used as an annual in colder climates. The ferny blue-green foliage is attractive and yellow-to-orange cups are eye=catching. This North American native is the state flower of California. 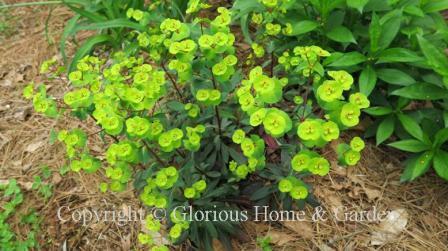 Euphorbia amygdaloides, wood spurge, Zones 5-7. One of the earliest spring perennials to bloom, wood spurge announces the awakening of the garden and produces long-lasting chartreuse bracts that are really eye-catching. The evergreen foliage is attractive all winter and some have red or colored stems and leaves. 'Ruby Glow,' shown below, grows 12-18" and has dark green foliage with red new growth. The contrast with the yellow bracts is wonderful. Galium odoratum, sweet woodruff, Zones 4-7. In my Zone 7b garden, sweet woodruff likes some shade and ample moisture, perhaps that it why it has not done well for me here with the southern heat and drought. I love it though, for its whorls of green leaves that look like Elizabethan collars, its fragrance and charming white flowers. This was used as a "strewing herb" in Elizabethan times along with lavender, mints, chamomile, roses, and others to mask foul odors and sweeten the air. 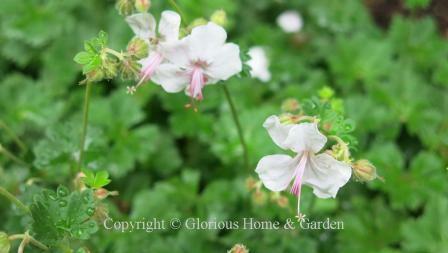 Hardy geraniums are lovely spring perennials and some continue on throughout the summer. These are the "real" geraniums, not the familiar summer flower box plants called geraniums, but which are actually pelargoniums. I have listed the very popular hybrid cultivar 'Rozanne' under Summer Perennials because of its long bloom period. Geranium x cantabrigiense, Cambridge geranium, Zones 5-7. 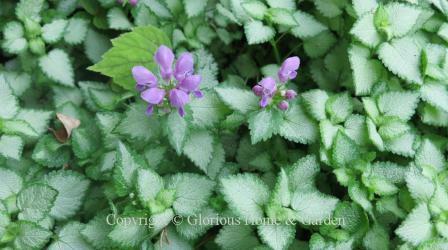 An evergreen mounding spring perennial that grows from 6-12” tall with purple flowers. 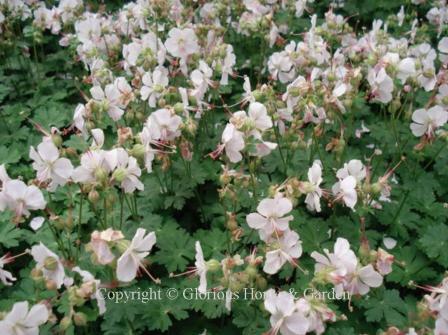 The ‘Biokovo’ cultivar has very pale pink, almost white flowers with pink stamens, and was named the 2015 Perennial Plant of the Year. Geranium cinereum, grayleaf geranium, Zones 5-7. 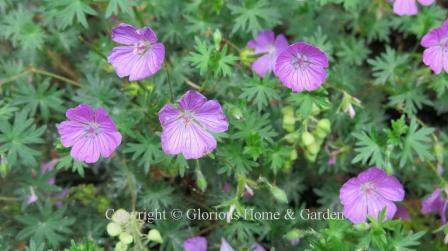 Geranium cinereum is an excellent low-growing spring perennial for the front of the border or a rock garden, requiring full sun and good drainage. 'Ballerina,' with soft pink veined flowers is shown below. Geranium macrorrhizzum, bigroot geranium, Zones 3-8. Bigroot geranium spreads by thick rhizomes (hence the common name), and thus it makes a nice dense ground cover, and the rhizomes help the plant endure periods of drought. The fragrant magenta flowers bloom in mid-to-late spring and sporadically in the summer. And, as a bonus, the lobed foliage is nicely fragrant, too, and turns reddish in the fall. Add that it is also deer-resistant and you’ve got a winner! Geranium sanguineum, bloody cranesbill, Zones 3-8. Bloody cranesbill gets it’s intriguing common name from the fact that the deeply divided leaves turn a brilliant red in autumn, and the seed capsule resembles a crane’s bill. Whatever the nomenclature, the bloody cranesbill is a fine spring perennial for the border forming low 12”mounds. Hesperis matronalis, dame's rocket, Zones 3-8. 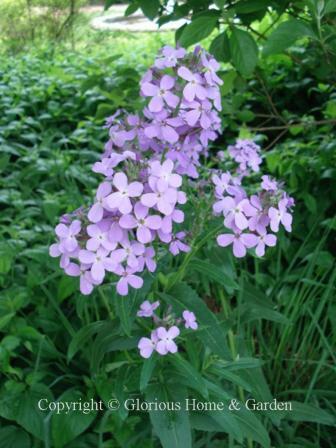 Actually a biennial, dame's rocket shoots up tall stalks of purple or white flowers in the late spring that make me think of a tall, skinny phlox. It is charming in the back of the border or in a meadow where it will self-seed and return for years. Lovely fragrance too! It likes a bit of shade and evenly moist soil. It is said to be invasive, but proliferation can be controlled by removing the flowerheads after blooming before they can set seed. Heuchera americana, coral bells or alumroot, Zones 4-9. Heucheras are great spring perennials to grow for foliage leaf color. The flowers are an added bonus, though they are tiny and arise on tall, narrow spikes. There are so many great hybrids developed from this North American native and other species that you simply have to choose the colors that will work best in your garden with your other perennials. There are green-leafed ones, purple-leafed ones, bronzy-leafed ones, silvery-leafed ones, golden-leafed ones, and mottled ones. Perfect for a shady garden in combination with hostas, tiarellas, crested irises, cimicifugas, bleeding hearts and others. One of my favorites is 'Raspberry Regal' which has green leaves and raspberry-red flowers that are more conspicuous than most and last a long time. Divide about every 3 years when the plant becomes woody to rejuvenate it. Iberis sempervirens, candytuft, Zones 3-8. 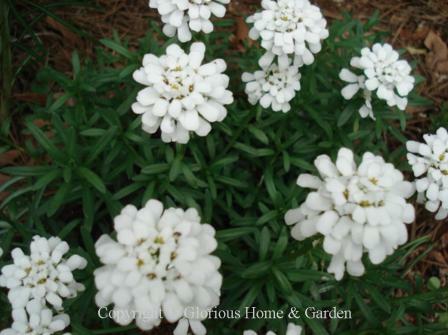 Candytuft makes a great ground cover. It's pure white flowers are indispensable in the spring and make a great foil for spring bulbs to push through. When the bloom period is finished, the evergreen foliage stays neat and tidy all year. Among the many candidates for the title of "Queen of Spring Perennials," the iris is second to none for beauty of form and color range. There are so many different types of irises with different characteristics that they deserve a section of their own. 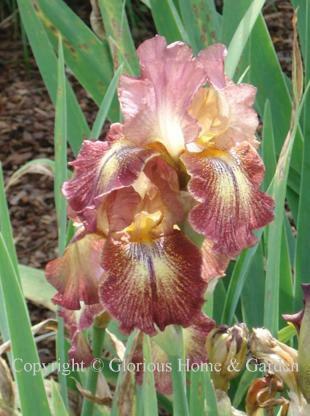 Click here for rhizomatous irises that grow from roots and tubers such as aril irises, I. cristata (crested iris), I. ensata (Japanese iris), bearded irises, Iris x louisiana irises, I pseudocorus (yellow flag iris), I sibirica (Siberian iris), and I. tectorum (Japanese roof iris), and others. Other irises grow from true bulbs such as I danfordiae, I reticulata, Iris latifolia (English iris), and Iris x hollandica (Dutch iris). Click here for irises that grow from true bulbs. 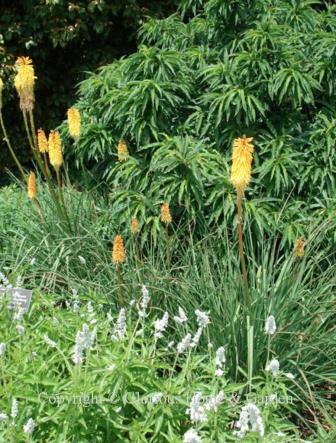 Kniphofia uvaria, torchlily or red-hot poker, Zones 5-8. Tall spires of red-orange or yellow make this a great spring perennial to accent the sunny border. Grow in full sun with good drainage. Lamium maculatum, spotted dead nettle, Zones 3-8. 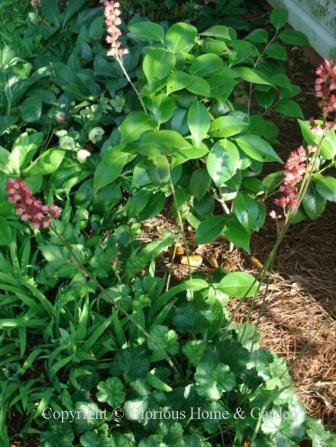 A good spreading ground cover that is useful for partial shady to shady areas—it does especially well in the Northeast and Northwest. Silvery leaved varieties such as ‘Beacon Silver’ help light up dark areas and even do well under trees. Other cultivars include ‘Lemon Frost’ with golden leaves contrasting with pink flowers, ‘Purple Dragon’ with silver leaves and purple flowers, and ‘White Nancy’ with silver leaves and white flowers. Lupinus, hybrid lupines, Zones 3-7. On a recent trip to England, I saw many gorgeous plantings of lupines such as these at Hidcote Manor. The clear colors of white, cream, yellow, pink, rose, red, purple, blue and violet, are lovely, and they stand at attention without any staking. Most of the spectacular garden varieties of lupines were developed by English hybridizer, George Russell, using North American species, resulting in dense spikes of pea-like flowers, sturdy stems and a rainbow of colors. The palmate leaves are attractive, too. Alas, they are not for the heat and humidity of the South, so if I want them, I have to treat them as annuals. 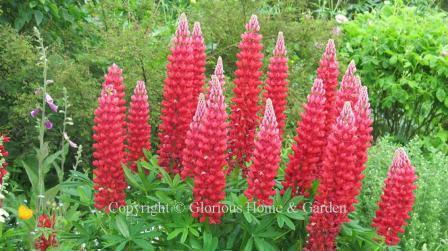 Easily grown from seed, lupines like full sun, and sandy soil which allows their taproots to penetrate deeply. 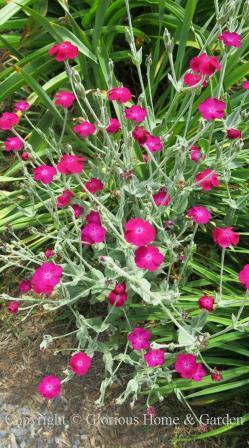 Lychnis coronaria, rose campion, Zones 4-7. Strong magenta flowers arise from soft silvery-gray foliage. This is a plant that will not be ignored, as the color shouts from across the garden. 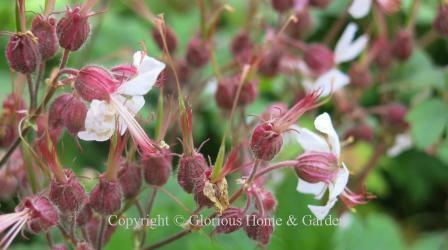 Rose campion is more of a biennial than a true perennial; however, the plant reseeds itself profusely so you will never be without once planted. In northern gardens, it is best treated as an annual. Nice in combination with white, of course, or with other hot colors like orange or purple. There is also a white one, L. coronaria 'Alba,' if a softer look is needed. Return to spring perennials A-D.
Return to spring perennials M-Z. Return to the Spring Garden.